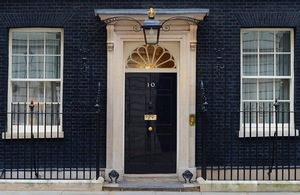 "As families and friends get together this Easter I would like to send my best wishes to you all"
Following an Easter reception in Downing Street this morning, please find below the Prime Minister’s Easter message. Easter week is a very important moment in the Christian calendar, so I would like to extend my best wishes to everyone here in the United Kingdom, and across the world, at this special time of year. This is the time when, as Christians, we remember the life, sacrifice and living legacy of Christ. The New Testament tells us so much about the character of Jesus; a man of incomparable compassion, generosity, grace, humility and love. These are the values that Jesus embraced, and I believe these are values people of any faith, or no faith, can also share in, and admire. It is values like these that make our country what it is - a place which is tolerant, generous and caring. A nation which has an established faith, that together is most content when we are defined by what we are for, rather than defined by what we are against. In the book of Luke, we are told that Jesus said, “Do to others as you would have them do to you” - advice that when followed makes for a happier, and better society for everyone. So as families and friends get together this week, I would like to send my best wishes to you all, and I hope and pray you have a very happy and peaceful Easter.